The popularity of touchscreen technology is growing immensely. You can find touchscreens available in grocery store self checkouts, movie rental kiosks and at airport check-in kiosks around the world. So, how do you decide which touch technology will work best for your specific application? Just like displays, there are a variety of technologies that are best suited for the specific application, use and environment. Life cycle costs play a major role in choosing a touchscreen. Resistive touch still dominates the marketplace, capturing approximately one-half of the touch market. Its low cost, stylus independence and technology maturity make for a difficult combination for other touch technologies to compete against. In the small screen size (less than 4"), the projective capacitive touch sensor has made a strong entry into the market, resulting from Apple's iPhone introduction. 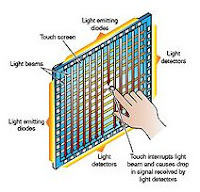 It has spurred additional development with glass on glass resistive touch screens. Large screen sizes (larger than 32") are being supplied with IR camera systems, which are relatively inexpensive and easily scalable. 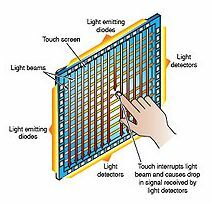 Traditional surface capacitive, matrix IR and surface acoustic wave touch technologies dominate the mid-size (6" to 26"). Again, use, environment and cost play important roles in choosing the optimum technology. With the myriad of choices in touch technology available for today's applications, which one suits your display function needs best? Look for the best touch technology for a rugged or outdoor environment in an upcoming post.